PRAGUE, Nov. 2, 2018 /PRNewswire/ -- Jeffrey Berns, CEO of Blockchains, LLC and company president David Berns hosted the company's global launch event during Prague Blockchain Week, revealing the long-awaited details of his plans for more than 67,000 acres of land in northern Nevada in what is now called Innovation Park. More than 1,000 developers in Prague for DevCon4 attended the Blockchains launch event on November 1 at Forum Karlin to learn about the company and Jeffrey Berns' plans for the future. 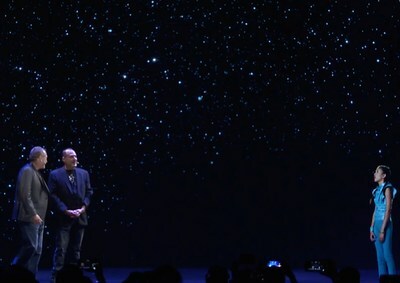 Blockchains, LLC Founder and CEO Jeffrey Berns, left, and company President David Berns reveal long-awaited details of a planned blockchain-based smart city to a crowd of developers alongside a hologram at their global launch during Prague Blockchain Week. 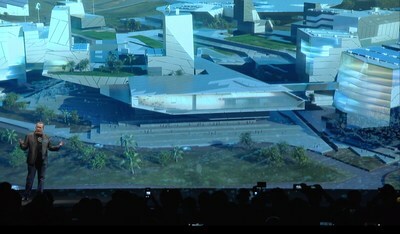 Visual effects for the event’s holograms were created by Digital Domain. "Blockchains will empower humanity by creating an environment where anyone, from anywhere, can collaborate together, establish the rules of that collaboration, and even exchange value, all enforced and executed by the public blockchain," said Jeffrey Berns. Berns unveiled several details of Innovation Park, including plans for the world's first smart city, where every aspect of daily life will be addressed using public blockchain to improve the way we interact with technology and infrastructure. He also announced the company will break ground on a Blockchains Campus, where developers from around the world will collaborate and create the advancements necessary to bring these concepts to life. He noted one of the key differentiators for this effort is the creation of a Distributed Collaborative Entity (DCE) rather than a typical company. He explained that the DCE, which has assets worth well over $300 million and zero debt, will ultimately be distributed among relevant stakeholder groups who will have ownership and control of Blockchains. "Our DCE is a forward-thinking business model that's in a class of its own with one goal: changing our world for the better," Berns says. "With the DCE, my vision is that the stakeholder groups will eventually be responsible for all corporate management and governance." Digital Identity. In 2015, Berns began developing NetID as an identity platform using vein-based biometric authentication to securely bind a user and their data to a unique digital identity. The application hashes and encrypts the individual's vein pattern, and other personal identifying information, and then places it on the public Ethereum blockchain so that the NetID user will be able to prove their identity to anyone as long as there is internet access. Control of, and access to, the user's information will be solely with the individual. The Modern-Day Fortress. Berns believes that eventually all assets will be digitized, and protection of that data will be essential. Blockchains has designed a digital asset storage solution which uses a multisig application along with decentralized physical storage. The custody contract is a series of formidable executable distributed code contracts (often referred to as smart contracts) that allow for the safe cold storage of digital assets, in a way that still allows for access to those assets when necessary. For the physical storage, they acquired two decommissioned military communications bunkers in different parts of the United States that were built by the U.S. government in the 1960s. For digital asset storage outside the U.S., they have also acquired the equivalent of a modern-day fortress that exists in a granite mountain in Switzerland, and one in Sweden. Once developed to specifications, these fortresses in three stable countries will offer unmatched digital asset storage protection. A Smart City. The Blockchains land in Innovation Park will be a smart city with a decentralized blockchain infrastructure underlying all interaction. The planned city will encompass, among other projects, a highly-secured, high-tech park that joins blockchain technology with artificial intelligence (AI), 3D printing and nanotechnology; residential units that will provide a new living environment to thousands; and various concepts that showcase how business development, residential living and commerce can flourish alongside world-changing technologies. Blockchains, LLC was founded by individuals who believe blockchain, in conjunction with other emerging technologies, will change all aspects of our daily lives for the better. The company maintains its headquarters in Innovation Park in northern Nevada, where it owns more than 67,000 acres that it plans to devote to the incubation of innovative ideas that simplify every aspect of our daily lives. By empowering the individual and restoring trust in all transactions, and fostering cutting-edge technologies, Blockchains LLC's goal is to help facilitate the technological revolution that will improve everyday life for the next generation.